Even if your dog is a regular at the grooming salon, a bit of pet pampering at home will not only maintain a glossy coat, but is also a way of checking for skin irritations or pesky parasites that might have set up shop in your dog’s fur. Maintaining a dog’s grooming routine is important not just because it keeps them looking good, but also because it allows us to keep a close eye on the condition of our dogs’ skin, ears, teeth and nails, solving small problems before they become big ones and avoiding costly vets bills and distress down the line. Sprinkling a bit of baby powder on your dog’s tangles means you will be able to comb them out a lot more easily. Make sure it’s talc-free baby powder to avoid irritation. Most dog owners let their dog’s nails go too long between trims. On average, their nails should be trimmed every three to four weeks. Your dog’s nails shouldn’t touch the ground [when standing], so if you hear a [loud] clacking noise on hard surfaces, the nails need some attention. Make sure you use the right brush for your dog’s coat type and clean the brushes after every use to avoid infections. For short-hair breeds, like labs, use a short-toothed comb. For medium-length breeds with undercoat, like the husky, use a double or single rake to reach the dead undercoat. For poodle-type dogs, use a pin brush and a slicker or straight comb. For long-haired breeds like Maltese, use a double rake, straight comb and also a slicker, depending on whether they have an undercoat or not. For wire-haired breeds, use a slicker brush and a wide-toothed flea comb for the hair on the face. 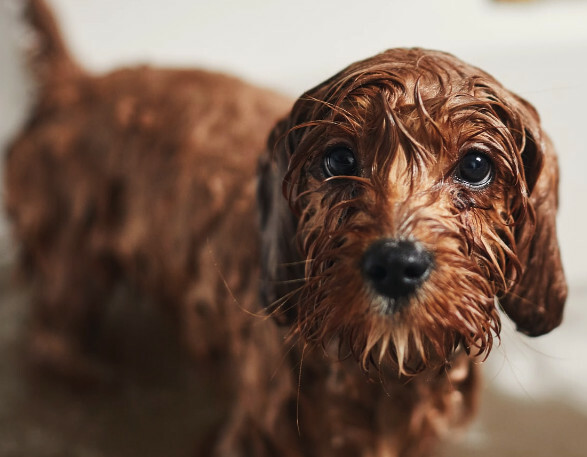 It’s important to use a shampoo and conditioner that is formulated for dogs, not humans. Human shampoos can be harsh and toxic if ingested. Go for an all-natural shampoo and conditioner as it’s better for their coats. And make sure you rinse every bit of shampoo and conditioner out of your dog. Ideally you’d be brushing your dog’s teeth daily, but for most healthy dogs a few times a week is fine. Again, they need their own products. Most human toothpastes contain fluoride, which is poisonous to dogs. Instead, there are meat-flavoured dog toothpastes which are understandably popular. It’s best to get a finger toothbrush too to reach right into the nooks and crannies of the dog’s mouth. Exercising your dog before you groom can help them stay still while you work on them. It’s especially useful for younger or high-energy dog breeds such as labs or border collies. Dogs that are eating a diet that isn’t balanced may not be getting the proper nutrients they need for a healthy and shiny coat. Low-fat diets may also cause an omega-6 deficit that can lead to coarse, dry hair. Check the label of your dog food to see if omega-6 is included – it should be.